Friday, 18 January 2019, 12:34p.m. A barrister has told how he pulled the Duke of Edinburgh from the wreckage of his Land Rover as he shouted "My legs!" after crashing into a Kia carrying two women and a baby. Roy Warne, 75, said Prince Philip, 97, told police he had been 'dazzled by the sun' at a T-junction before the collision near Sandringham in Norfolk. He was first on the scene of the accident and helped free the "conscious" but "disorientated" royal from the car as it lay on its side. He told The Sun: "I looked down and had the Prince's blood on my hands. All I could think is, thank goodness there wasn't more." 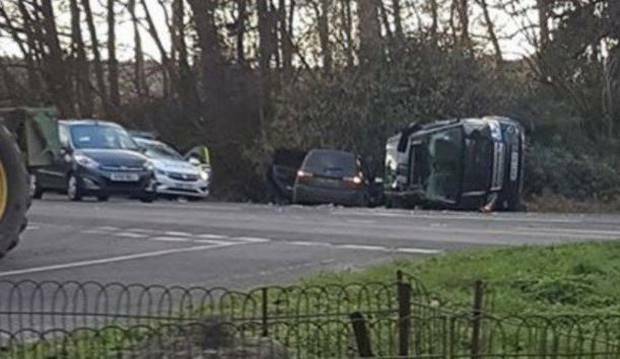 Prince Philip is "conscious but very shocked and shaken" after a dramatic crash near his Sandringham Estate, which left two women in the other vehicle in hospital and the Land Rover he was driving on its side in a crumpled heap. The Queen is by his side following the collision which happened just after 3pm Thursday local time when he pulled out of a driveway onto the A149 in Babingley, Norfolk which leads to the royal grounds. A "shocked and shaken" Prince Philip was assessed at medical facilities on his Sandringham Estate following a car accident involving two others. The Queen is reportedly by her 97-year-old husband's side following reports that the Prince rolled his Land Rover after being "T-boned" by a Kia when he pulled out in front of it. The occupants of the people-mover-style Kia were two women who were taken to Queen Elizabeth Hospital with minor injuries and cuts. They have since been discharged. An image of the crash scene from ITV. Meanwhile, Philip has been given the all clear by a doctor. Prince Philip and the female Kia driver were breathalysed at the scene and both gave negative readings. Pictures from the crash scene show the Prince's Land Rover flipped on its side following a crash with a black people mover. The duke's vehicle was pulling out of a driveway onto the A149 motorway when the accident happened. According to eyewitnesses, the vehicle that the duke was driving overturned. One witness said they helped the duke out of the vehicle. He was conscious but very shocked and shaken, royal correspondent Nicholas Mitchell said. The witness told the Telegraph the duke had seemed "quite distraught" in the aftermath of the incident, as police arrived at the scene. A Buckingham Palace statement said: "The Duke of Edinburgh was involved in a road traffic accident with another vehicle this afternoon. Police officers secured the crash scene, while an ambulance crew assisted two people with minor injuries. A police spokesman said: "We were called to the scene at around 3pm to reports of a two-vehicle collision. It is believed that Philip's Land Rover was heading out of a private estate road on the western side of the A149 when he was hit. UK correspondent Phil Dampier told Newstalk ZB's Tim Dower the accident happened just off the estate. "The duke turned onto a public road and a car was coming the other way with a couple of people in it." "Now obviously I am not going to say who was at fault but in some way shape or form there was a collision and the Range Rover the duke was in overturned and miraculously he walked away from it." Dampier said the duke is uninjured and resting with the Queen, but there are questions over his driving. "Obviously there will be questions asked about whether a 97-year-old, wearing glasses and a hearing aid, should be on public roads." "He hasn't had a crash like this before and he does drive around the estate quite often and it's perfectly normal and he is actually a very, very good driver so I don't think there will be a problem there, but obviously, if it turns out he was at fault for this accident on a public road then questions will be asked." Dampier said the duke is still very active and enjoys carriage driving, fishing and driving around the estate. The passengers who were in the other car are said to be okay following the crash. It is unknown who was at fault for the crash, but Dampier said Prince Philip would likely own up if he was at fault. "He will be muttering to himself. He will be the first person to admit if he's made a mistake but I can't see him giving up driving." Prince Philip, who underwent hip surgery in early 2018, was pictured enjoying a solo spin around Balmoral as recently as September last year. The elderly husband of Queen Elizabeth has become increasingly frail in his latter years, but is fiercely independent and still drives himself around the royal estates. Now officially retired from public duty, the duke was last spotted attending church with the Queen and extended family on August 19. The Queen and the duke have been at Sandringham for several days and attended church on Sunday. The 97-year-old duke has suffered a string of minor health issues in recent years although he has remained largely mobile and independent, particularly given his advancing years. Prince Philip most recently prompted speculation surrounding his health when he chose not to join the rest of the Royal Family for the traditional Christmas Day church service at Sandringham. In response a royal source told Reuters: "The duke is in perfectly good health, he is just spending the day privately." 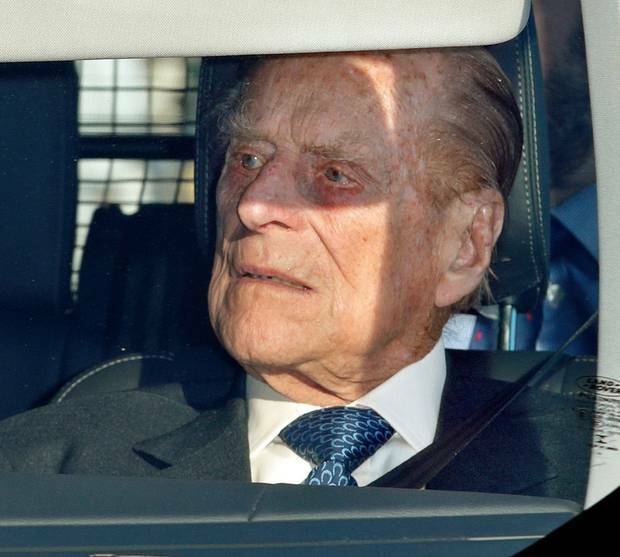 Prince Philip was hospitalised in April last year and underwent hip replacement surgery, although he has been seen carriage driving a number of times since. The condition forced Prince Philip into the hospital twice in 2012. In 2015 Prince Philip sported a badly bruised eye at a reception to commemorate the 800th anniversary of Magna Carta at Buckingham Palace. He was also wearing two butterfly stitches on a cut to his right ear. Buckingham Palace do not comment on the health of the royal family but played down Philip's new facial injury by saying that he was: "Well enough to attend the event."